Photovoltaic Laminates can be applied to Dimond®Roofings range of tray products to enable solar power generation, including Solar Rib, and can be applied at the time of installation, or after the roofing profile has been installed. Laminates are 348mm wide and available in 5.910mm and 2.585mm lengths, and in general, have a lead time of 12 weeks. Aesthetic, for example with laminate, unlike glass panels there are no obvious protrusions or exposed cabling. 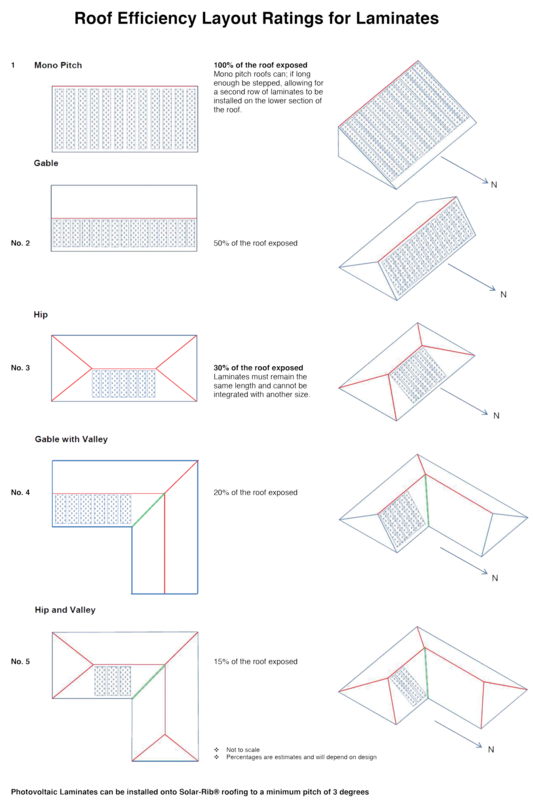 Photovoltaic Laminates sit in the roof tray, require no additional fixings and fit seamlessly into your roof profile. Laminates can be also used on curved roofs. The highest kilowatt hour yield per watt (peak) and have a high-efficiency rate even when in the shade of at a low pitch. Fully supported by roofing manufacturer Dimond Roofing® and only installed by recommended installers giving peace of mind in the quality of materials and workmanship. Once a profile has been chosen for the building project we recommend you and your designer work with us on your requirements. This takes into consideration the roof design and the potential for power generation. The roofing tray is cleaned, and Photovoltaic Laminates are applied. Once the laminates have been applied, wires are run from the panels to the inverter, which is generally located close to the main switchboard. The invertor will then be wired, and the local power authority will then be involved to connect the import-export meter and grid tie from the meter. If installing a profile, and then adding PVL at a later date, pre-wiring can be organised with your electrician. Ideal laminate lengths must remain consistent throughout the roof for residential projects. Note: Not to scale, percentages are estimates and will depend on the design.